Sunset, Vigland Shred Vasa And No One Got Frostbite Over It — kolo t.c. Sometimes, fat bikes are just fun. They’re fun not in spite of the cold and snow and conditions. They’re just fun, without further qualification. 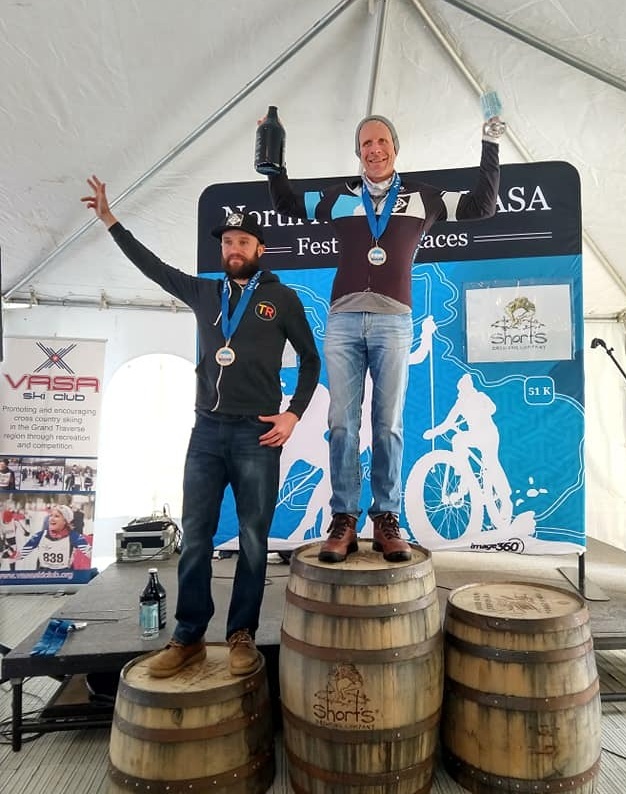 And this weekend’s Vasa Fat Bike race was one of those. It was fun, and it wasn’t too cold, and the course didn’t go to crap, and no one lost their fingers or ended up in a ditch on the drive north. And that’s pretty cool, isn’t it? Sure is. With over 100 racers on the line, the Vasa is one of the big obese events of the year. With a million little fat bike races around, having a few lodestar (thanks for that word at least, Mike Pence) events to measure everything else against is rather important. Fat Chance, Vasa and, when they actually have it, Beard of Zeus, and you’ve got yourself a pretty darn solid fat bike season up here in the tundra of Traverse City. After Matt Acker’s win and Jorden Wakeley’s runner-up at Fat Chance, Sunset Scott was always going to be finishing high up in points with third, but you can imagine his relief when Acker wasn’t coming north and Wakeley decided to go get a top 10 in the 50km ski race. With last year’s other podium finish Cody Sovis also deciding to giving the ol’ scootch a go, Sunset was up against Rick Wetherald and teammate Tyler Weston for the Vasa crown. Even an on-form Nick Zambeck (now with two functional knees) could threaten….in theory. But what these out of towners may not have known is that Sunset lives on the VST from December to March, and ‘home turf advantage’ doesn’t even begin to cover it. It’s a bit like sending Arnold Schwarzenegger and Carl Weathers to Predator’s homeland to duke it out; Predator doesn’t need the help. It ended up being Sunset, Rick, Tyler, and Nick, and Sunset and Rick look GOOD for the Series 1-2. On the women’s side, Susan Vigland skipped skiing to fat bike, and she eased her way around four laps to another Vasa win. She’s won the Series before and the Vasa in the process, and runner-up Chelsey Schlict has her work cut out for her with Dogman Challenge and Beard of Zeus left on the docket. Some mad propers to Marylin Kamp for racing after skiing, a feat matched by Joe Leppeck, Keitha Conway, and Marc Brunette. It was a feat superceded, however, by probably-my-cousin-maybe Dan Novak, who did the 50km ski, 40km fat bike race with about ten minutes’ rest, and then the 34km ski Sunday, too. Freak. Cindy and John Duby are going to almost certainly win the Master’s categories after another strong showing at Vasa. John even cracked the top ten overall, and they’re flying the flag rather proudly for City Bike Shop this winter. Nice. It’s two weeks until the Dogman Challenge, then just a quick week until the Series caps off with the Beard of Zeus. This year, proceeds of BoZ go to the Northern Michigan Mountain Bike Association. NMMBA grooms all winter and cuts trail all summer, and since we’re too lazy to do either, we like to support them as much as possible. We’ll be building the Vasa SingleTrack Time Trial (VST TT) into the Speed of Light calendar for 2019 and probably forever, and we want YOU to get your race season started at BoZ, please. Or at least show up and cheer. Results from Vasa here. Registration for BoZ here. Hot new playlist for your trainer trainin’ right here.